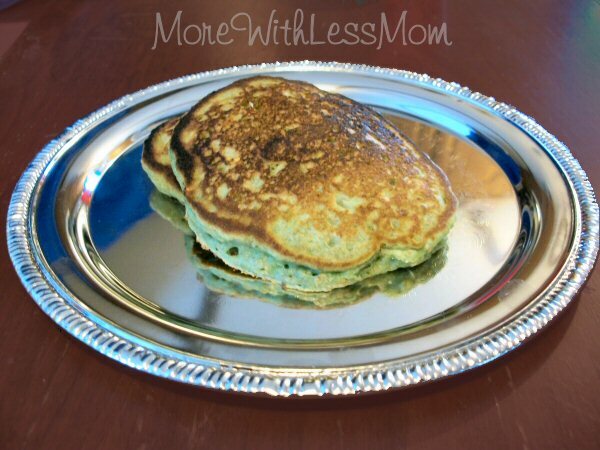 Here is a healthy breakfast alternative for your St. Patrick’s Day celebration. They are a little less fluffy pancake and a little more hearty goodness. These are based on Taste of Home’s Brown Sugar Oatmeal Pancakes. I made them a little healthier. And green. If you do not have buttermilk you can measure out 4 Tbl vinegar, add enough milk to make 4 c, and let that sit 5 min. Then soak your old fashioned oats in the buttermilk. You can use quick cooking oats and skip the soaking. If you soak for 5 minutes the texture will be a little different from a regular pancake, but your kids won’t know there are oats in there. If you soak for 2-3 min you will still have an oaty texture to your pancakes that I like. If you want to make a simple syrup topping: Combine 1 c water, 1 c sugar, stir to dissolve sugar. Add 2 c chopped/sliced fruit (blueberries, strawberries, apples). Simmer about 10 min, while you are making your pancakes. Combine flours, baking soda, salt, cinnamon (optional, modify amount to taste), wheat germ (also optional, modify amount to taste), and brown sugar. You should be able to decrease the sugar but I did not try it. In another bowl mix egg, applesauce, food coloring, and buttermilk/oat mixture. You can see in the pictures the green I got from 10 drops, you may want to add more color. Pour by 1/3 cupful onto a greased hot griddle at 350 degrees. Turn when bubbles form on top. I found with this recipe they were often done when the first bubble popped. Cook until the second side is golden brown. I put my pancakes on a cookie sheet in a warm oven until they are all done. We served with applesauce, strawberry simple syrup, powdered sugar, or maple syrup. You could also try molasses.